In the middle of Colchester sits this great triumphal arch. Affectionately known as "Jumbo", the arch is in fact a great water tower. The architect was Charles Clegg, surveyor to the Borough Council. 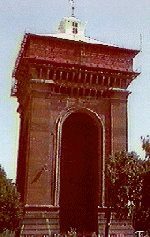 It was Clegg�s bold vision to raise the great tank one hundred and thirty feet aloft making it the second tallest water tower in the Kingdom. Since Jumbo ceased to supply water in 1987, ideas have come and gone as to how to save the building. The most recent scheme was to convert Jumbo into a nine storey block of flats enclosing the archways with glass and steel. The controversial scheme was rejected.